I entered Manchester as a colleague from work said it was a flat, fast course. I may have set my personal best at Abingdon but found training for an autumn marathon difficult with all the distractions of summer so I wanted to try a spring marathon. London is rarely a PB course due to the number of people and Manchester sounded like the right type of course at a time when I could train with the London runners. I stayed near Manchester with in-laws the night before and arrived at the carpark soon after 7am. The parking was at the Old Trafford stadium car parking and the E2 carpark was less than 200m (E3 is not much further) from the finish so I didn’t bother with the baggage tent. 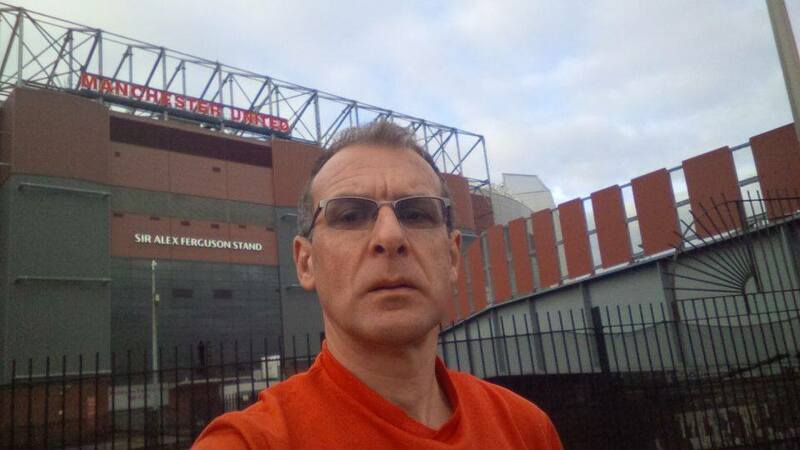 Selfie taken and posted to Facebook along, following last week’s blog point 1, with my excuses for a poor run. Malt loaf eaten, cup of tea drunk and I was ready for the off. I had a quick word with the SJ North Eastern Branch (Matt Wilkinson) who also had no idea how he would do but was hoping to go sub-3:30. My plan was to set off at a pace to beat my PB and, when the wheels fell off as they surely would, stay ahead of the 3:30 pacer. The 3:15 pacer was about 50m ahead of me at the start so I decided to hang just behind him as far as possible and then I should have 5 minutes or so to drop back and achieve my PB. This plan was similar to Abingdon in 2013 when I ran at a ‘steady, gentle’ pace set by Carl for the first half and managed 3:22 taking several minutes off my PB. The course is along mainly closed roads where you run down one side, do a loop and then run back again, turn a corner and repeat in a different direction. 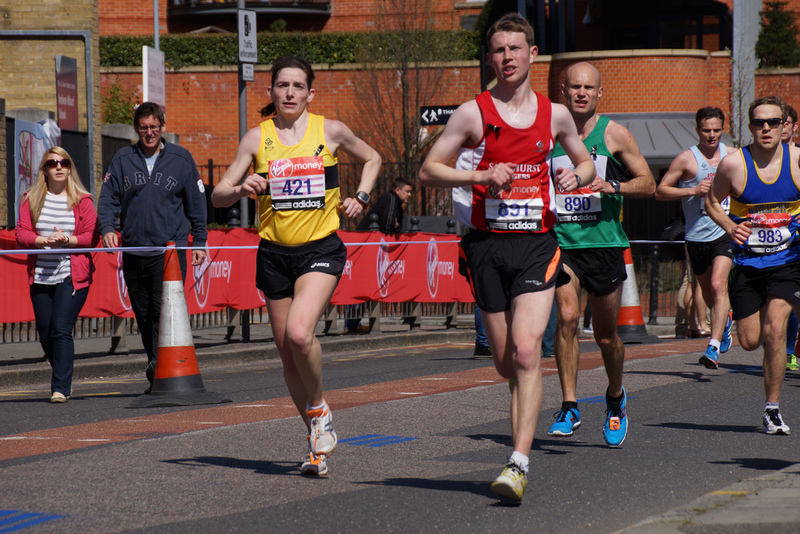 The advantage is that there are usually plenty of other runners on the other side of the road to keep your interest, but there are traffic cones separating the two streams which early in the race are a bit of a trip hazard as the faster stream spreads across the road into the empty lane. At least one runner tripped and fell. Looking at the map the route does not look inspiring but the support was pretty good. I doubt there was a mile where there was not someone out cheering and in all the villages the crowds were pretty noisy. A decent rock band, a church choir and a children’s choir were out entertaining the race as well as some more impromptu items. There is a hill at Altrincham (about half way), a gentle slope up and down which, after the pancake flatness of the rest of the course, was noticeable but that was it. The course really is flat, about the 2/3 the total climb of Reading half only spread over twice the distance with only one hill (~20m) that you would notice and nothing like those in Reading. Through the halfway point at 1:38 (gun time) so I knew I was on track but marathons really start at around mile 20 (20 mile warm-up 6 mile run). I was keeping the 3:15 pacer in sight, sometimes catching him up and then easing off to drop back a bit. I resisted the temptation to pass him on several occasions. I was taking a isogel every 3-4 miles. I have been trying to remember to eat much earlier in marathons in the hope that this would stave off hitting the wall. After a couple of gels I tried some of the carbosweets (My daughter and I have done a few sportives and have a lot of boxes of all sorts of exotic sports food guaranteed to make you run faster, given away as part of the sportive entry). I was taking a sip of water at each of the water stations. In endurance events if you start to wonder why you are doing it, it is usually because you are running low on energy and need to eat (and it is probably too late to correct). A couple of times I started to drop away from the pacer but knew that if I dropped too far back I would never catch him again (I had distinct memories of Friday’s track session and encouraging Jackie to stay with me for the last repetition for just the same reasons). As the race progressed my plan changed to try to stay with the pacer all the way and nip ahead at the finish. I reasoned that he would be pretty close to 3:15 and so I would be getting a PB even if I just stayed with him. Soon the 20 mile marker came up (I did not see many mile markers, those that I did see were at head height so if you were towards the middle of the road they were blocked by runners) and, as I was with the pacer and still running comfortably, I finally decided that I had to see how far under 3:15 I could go as this might be my only chance to find out. I threw away the pace notes that I had not looked at and cruised past determined to stay ahead. On a couple of occasions I could hear the crowd cheer a bit louder which I took to mean they could see the pacer. Some runners turned round to look past me which I took to be them looking for the pacer but I resisted all temptation, if he came past then so be it. All I could do was run as fast as I could to the finish and I was going to get a PB. The last few miles went smoothly, just concentrating on eating, drinking and maintaining a pace. Suddenly there was the finish and the clock was showing 3:14.01. I would be under 3:15! Time to see if I still had a sprint and it appeared I did (I have not had one of those for several years!). Crossed the line, collected an enormous medal (what is it with big medals at the moment?) and goody bag, put on taped compression running tights (highly recommended) and started the 4 hour drive home. Use the official car parks (£10). E2 is really close to the finish, (E3 is not much further away) and not far from the motorway. There are loads more toilets past the baggage tents with no queues so don’t waste time with those near the entrance. Thank you Patrick and congratulations on a fantastic PB. I’m sure if you have any questions for the great man he will be happy to answer them at a Monday night run! (You’ll have to try and keep up of course).